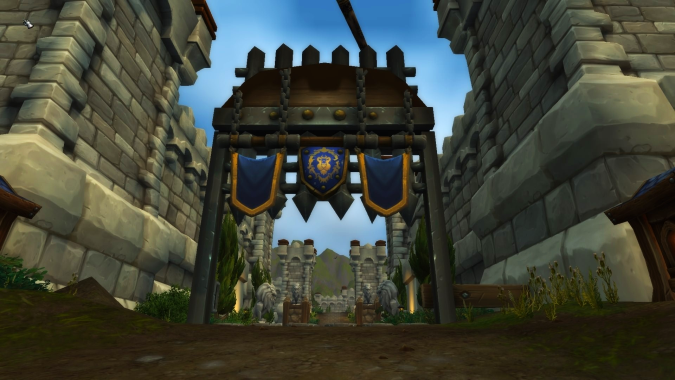 Warfronts are one of the supposed flagship features coming in Battle for Azeroth. 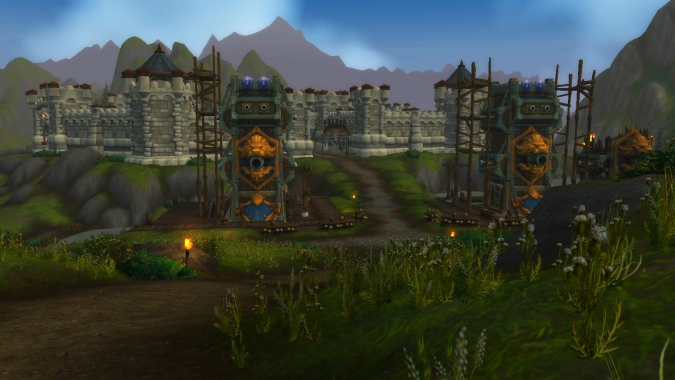 These 20-person, PVE scenarios represent your faction’s taking (or retaking) of a major strategic location in Azeroth. The first of these is the Battle for Stromgarde in the Arathi Highlands. 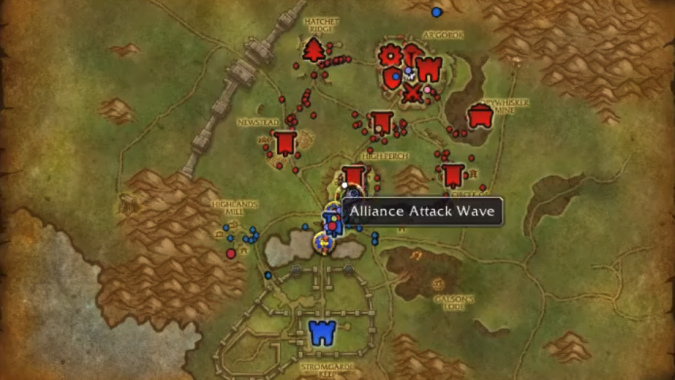 Horde start on a northern outpost and move in southward as they press the attack, while Alliance start in Stromgarde itself, first retaking the base and then pushing the Horde out of the zone entirely. 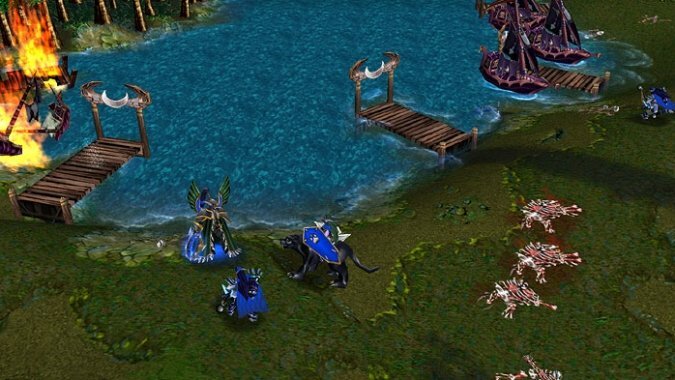 These battles are intended to recreate the feeling of Warcraft 3 — gathering resources, fighting attack waves, and pushing in on an enemy base. So why, then, do they feel so… hollow? I’ve had a chance to play both Horde and Alliance sides of the battle on the beta, and I think I have a couple ideas why. Warfronts have all of these. The match starts out somewhat slower, with your team dropping in from an airship and laying claim to the location that will be your main base. From there, you can claim the mines (to gather iron) or the forest outposts (to gather wood) — or, your team could split up and attempt both. Once you have the resource outposts, it’s easier and safer to gather. Plus, grabbing the mines allows a regular supply of iron to fill your own personal cache back in the base. That’s all well and good, but where it begins to fall apart is the need for players to return to these spots and gather resources. In Warcraft 3, your Peons continually gather resources for you while you focus more on the action side of things. But because players are the ones doing the gathering, players are also the ones becoming the Peons. If most of your team is out on the front lines, someone — by nature of Warfronts’ design — is going to need to be gathering resources. One player or another has to be that Peon. Is it a nice break from time to time? Sure. But when things start getting more intense, it’s a real bummer to have to cut off from the action to go grab wood. In an RTS, it’s usually a matter of moving your camera to Peons and clicking on a resource supplier. In WoW, you are moving — not the camera. Similarly, building up your base and empowering your troops feels lackluster. Where building a base in RTS games does require resource gathering and choice of where to use those resources, it doesn’t limit you in which buildings you build. Yes, some are gated behind other buildings, but once you have a building unlocked and the resources to do so, you can put five of the same building type all in a row and start pumping out troops. By the end of the game, it’s just plain satisfying to look at what you’ve managed to create from the ground up. Unfortunately, buildings on the beta weren’t actually appearing, so it’s hard to say for sure if that feeling of “Whoa, look at the huge base I’ve put together!” is entirely gone — but having specific buildings to construct isn’t going to do it any favors. As for troops, there’s definitely an issue of control (more on that below), but in general, it would be nice if upgrading them actually seemed noticeable. I fully admit, I could have missed units gaining bigger, better armor as my team dumped resources into upgrades. But as far as I’m aware, the only distinction for upgraded troops is the presence of a buff. Again, it’s satisfying to see just how powerful your units are and how many of them you have. Big, hulking Abominations gathered en masse are a sight to behold, and the small waves of Ghouls at the start of a match pale in comparison to them. But you don’t get that in Warfronts. Upgrading your troops means they can push better — and it is noticeable — but it doesn’t look any more impressive. Once again, that satisfaction of seeing what you’ve managed to amass by the end of the game is gone. This portion is admittedly open to a bit subjectivity, but to me, there are two big aspects of RTS games that make them fun, and neither is really possible in Warfronts. First, there’s the constant micro-managing that you need to do as you work toward your ultimate goal. Using one group of troops to attack the enemy as a distraction while you take a second group to claim a key resource location and continue to maintain your own resource management and base-building is chaotic. But it’s also fun. You are in control of each of those sub-groups. You make the decision to send X number of troops to the first point and Y number to the second point. You get to celebrate the success of having pulled off a proper strategic maneuver. None of that feeling exists in Warfronts. Theoretically, the closest you can get to that experience is taking charge of the raid and giving instructions to the rest of your team. But will your team listen? Even if they listen, will the amount of people you’d wanted to send to a location actually go there? Or will you be stuck with two or three players who listen while the rest continue about their own business? Heck, even if you successfully lead your entire raid group for the entirety of the match, it’s still not the same feeling as controlling groups in Warcraft 3. It’s a feat worthy of pride, don’t get me wrong — but it’s still telling instead of doing, and you are only ever going to be in one location at a time. I realize these are not all Void Rays. But still… lasers! The second thing I love about RTS games is the ability to amass far more units than I would ever realistically need and proceed to demolish the enemy base in one single push. 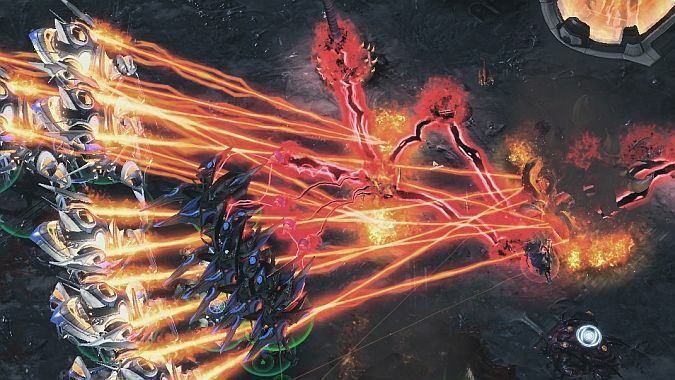 One of my all-time favorite “strategies” in StarCraft 2 is to make Void Rays. Then, I make more Void Rays. Eventually, I make a whole heck of a lot more Void Rays. You know what I do when I have enough Void Rays? I make more Void Rays. It’s by no means an effective strategy if you’re playing on anything other than a lower difficulty, but it’s fun. It’s the stupid kind of fun that you do because you can. But in Warfronts, you don’t get to do that. Even if your team has recruited literally no troops, and even if you have gathered enough resources to create an army strong enough to take out the enemy in a single attack, you can’t actually control the units you recruit. They will head down whatever path they’re programmed to and fight things along the way. I’m admittedly not familiar with how they’re programmed. It could be that they support the area with the least defense, it could be that specific units go to specific locations. Regardless, the outcome is the same: You cannot control where they go. Is it possible to make Warfronts feel less hollow? While my suggestions aren’t perfect, I do have a couple that might at least help alleviate the issues I’ve described above. For instance, making empowered units stand out more would require either new models or the altering of armor, but it would make your upgrades feel more meaningful by the end of match. Again, I can’t really comment on the building aspect because they didn’t appear in beta tests. As for resource gathering, it would be nice to have a steady supply of wood just as you do iron (once you’ve claimed the mine). But it would also be wonderful if enemy troops dropped resources, allowing you to stay in the fray while still earning resources to bolster your base and forces. I debated the effect of a “per match” cap on resource gathering to prevent one person from needing to carry a team’s resource count, but it seems more likely to backfire. If someone’s not going to help gather resources, they’re not going to help gather resources. In terms of directing troops, I’m curious how an option to direct them down a certain path would turn out. For instance, if you recruited a ton of foot soldiers and then had a short window of time to say, “Hey, go attack the Alter of Elements!” If you don’t answer within a few seconds, those units just automatically pick a lane as they currently do. Since trolling is a possibility, the ability to send units to one area could be limited to one specific type, rather than being able to do so with archers, warriors, casters, etc. Again, not a perfect solution, but potentially an improvement. I’ll be up front about this: I don’t know if it’s worth the effort to try to fix Warfronts and continue adding more locations. While some of the suggestions I’ve offered may help my specific complaints, they still won’t fix them — and they’re still only my complaints. Other players may have different experiences in Warfronts. Some may dislike aspects I didn’t notice. Some may even love Warfronts as they are! I’ve been a bit negative, but it’s not like I didn’t enjoy parts of the experience. In my second go-around, I was in voice chat with four others and could coordinate. It did feel a lot better than my solo experience. 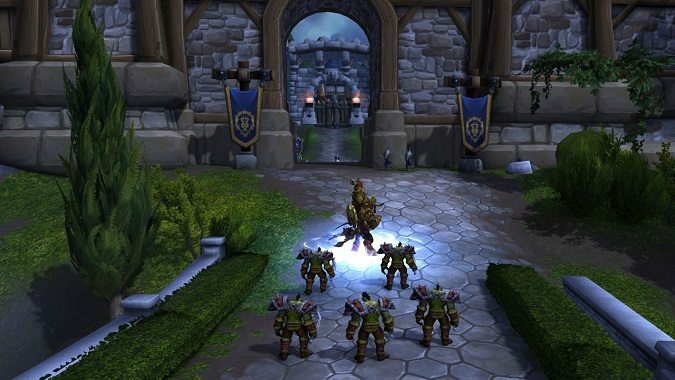 All the same, Warfronts may change for the better and become their own, absolutely fun experience — but I’m not sure they’ll ever be able to feel as much like Warcraft 3 as anyone had hoped.